New Orleans continues to slowly recover. Sports have been a part of that recovery. Ten years have passed since the wind blew and the waters rose in New Orleans. Ten years since lives were lost and others were irretrievably changed. Ten years since a nation watched as a great and beloved city was battered by the random cruelty of nature and the inexcusable incompetence of government. Ten years since Katrina entered the lexicon of American culture, a symbol of pain, sadness and devastation, yet also of courage, strength and perseverance. The storm crashed ashore in the early morning of Aug. 29, 2005, submerging much of New Orleans in the waters of the Gulf of Mexico and Lake Pontchartrain. Drew Brees was 1,600 miles away, participating in his fifth training camp with the Chargers, his third as the starting quarterback for the franchise that drafted him in 2001. He watched on television like so many others, unaware that one day post-Katrina New Orleans would be a part of his life and he would be a part of its life. Doug Thornton, a former quarterback at McNeese State who had lived in New Orleans since 1984, was at the Superdome, where he was the building’s chief executive as a regional vice president for the management company SMG. The building was already filling with residents seeking shelter. Water was lapping at its walls. Wayne Reese was getting his football team ready at McDonogh 35, a high school in the Seventh Ward. Reese had spent 53 of his 60 years in New Orleans and had lived through Hurricane Camille in 1969. Very few U.S. cities have faced in modern times what New Orleans faced in that late summer of 2005 and in the decade since. San Francisco in 1989, perhaps. New York City in 2001, certainly. Tragedy of such horrific scope is blessedly rare. New Orleans continues to slowly recover, a smaller city and a different city. There are still lines of discoloration on many buildings, silent reminders of how high the floodwaters rose. Sports have been a part of that recovery. Teams, players, buildings. Sports have helped New Orleans as they help us every day. Between its opening in August 1975 and the arrival of Katrina, the Superdome had been not just the dominant feature of the New Orleans skyline but also a vital part of U.S. sports culture. It had hosted six Super Bowls and four Final Fours. Michael Jordan beat Georgetown here, and Chris Webber called a timeout he didn’t have. Roberto Durán said no más. Every year it was the site of the Sugar Bowl, and sometimes a college football national championship game. So it was that Americans saw this place for games turned into the symbol of Katrina’s suffering. Thornton stayed at the Superdome for five days before leaving by helicopter as the evacuation of the building finally began on Sept. 1. A decade later he is an executive vice president at SMG. He works every day in the building, both proud of its survival and haunted by its memories. “Some days I’ll be walking around when it’s empty, and I’ll look at some area and I can see the people who were living there,” Thornton said last week, sitting in a concourse-level conference room. There is an elevator vestibule on the 100 level; Thornton can picture the older woman who sat there for three days with her back to two walls for safety. On the fourth day she was gone. When Thornton hears a helicopter, he remembers the unceasing chopper roar. “One day I saw a mother and two young girls jump off the helicopter, nothing but the clothes on their backs,” he said. “And the father was on a gurney, with all sorts of tubes hooked up.” he paused to collect his emotions. “I don’t know what happened to any of those people,” Thornton said. And he can’t forget the smell, of human beings and mold and waste. 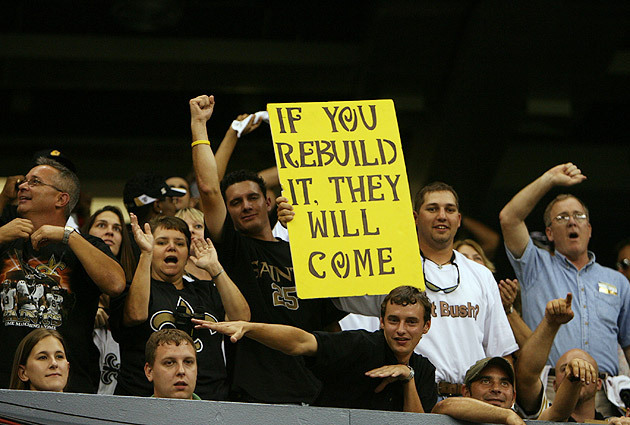 But the Dome’s rebirth became a symbol of New Orleans’s recovery. At the urging of then NFL commissioner Paul Tagliabue and at a cost of nearly $200 million, the building was readied for the Saints’ 2006 home opener, on Monday night, Sept. 25. A team that had been forced to play half its home games the previous season in San Antonio and half at LSU’s Tiger Stadium in Baton Rouge returned home to defeat the Falcons. It was the Saints’ third consecutive victory in a remarkable season that wouldn’t end until they lost the NFC championship game in Chicago. Their quarterback was Drew Brees. He is 36 now, the father of three sons and a daughter, about to begin his 10th season as quarterback of the Saints—a one-team tenure currently exceeded only by Tom Brady’s with the Patriots (14) and Eli Manning’s with the Giants (11). Since Brees and coach Sean Payton arrived, the Saints have gone 93–61, including the postseason, and won the franchise’s only Super Bowl, after the 2009 season. Much more important, the team—always beloved, even as a perennial loser—became a symbol of hope and perseverance. To this day Brees is humbled and vaguely overwhelmed by the emotions—devastation, loss, survival, rebirth—that still hang heavy in the city. “To be honest, even now, I’m not sure I realized what I was signing on for,” he says. “I’m not sure I understood what the city had been through.” He had suffered a severe shoulder injury in the last game of the 2005 season, and it was uncertain if he would be an effective player again. The Saints were the only team to offer him a free-agent contract. An orphaned city welcomed a quarterback abandoned by the rest of the NFL, even as Saints ownership considered leaving the city permanently. Wayne Reese became a high school football coach 43 years ago. His best pupil was Marshall Faulk, the Hall of Fame running back whom he coached at Carver High in the Ninth Ward. Katrina devastated the already struggling New Orleans public school system and the athletic programs that went with it. Slowly, those programs have fought back. History will show that the waters thrown upon New Orleans by Katrina receded in the days and weeks after the storm made landfall. But true recovery has taken much longer. Sports offered its hand to the city, and the city reached for it. It was not enough for rebirth, but enough for hope.